Here’s a hypothetical question: What would happen on Election Day if only men or women voted? Here’s a data-driven answer. Men would sweep Republican presidential nominee Donald Trump into office while women would vote overwhelmingly for Democratic nominee Hillary Clinton. That’s according to a recent report from FiveThirtyEight, which released two electoral maps that reveal the gender gap in American politics. Because many states are required to cast their electoral vote based on the result of the popular vote, this is what the electoral map would look like for each gender. A few basic statistics help explain this stark contrast. 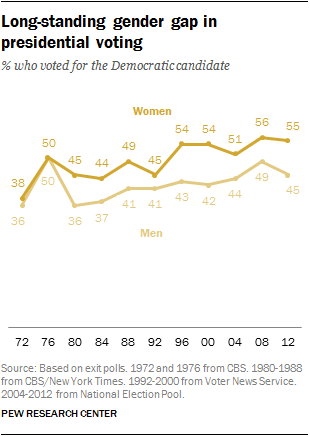 First, a majority of women have voted for Democratic presidential candidates in the last nine elections, a 2016 Pew poll found. Men, on the other hand, have historically leaned Republican. Political scientists believe that the modern, political gender gap developed in the 1980s, when “more women were working, more were single and living on their own,” and they felt increasingly enabled to vote in their best interest — not necessarily how their fathers or husbands voted, Slate reported. Second — more recently in the 2016 election — Trump has fared far worse among women voters (particularly college-educated and Independent party women) than previous Republican presidential candidates. His insults about women, criticizing their appearance, and getting caught making controversial remarks about his sexual behavior have alienated some female voters in the GOP base, leaving him with a 70 percent unfavorable rating among women in a recent poll.